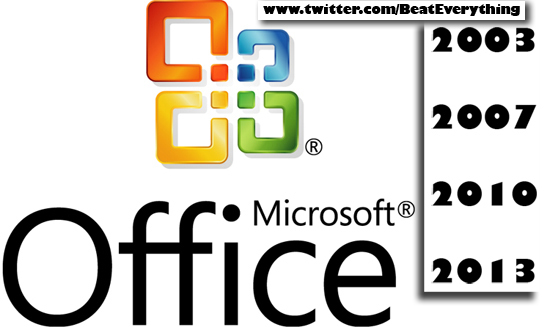 Microsoft office is being used by large amount of users throughout the world. It is used for writing, for making presentations or for office data etc. But its old versions are completely dissimilar from new versions. If you have a file produced with Microsoft Office 2007 it will not work with MS Office 2003. Microsoft introduced new document types in new versions. All these rapid changes were made in MS Office 2007. Microsoft Office 2010 has functions similar to Office 2007. No major changes were made but now new version (MS Office 2013) has arrived and I completely don’t know what Microsoft integrated in that. I just know that Microsoft Office 2013 only support Windows 7, Windows 8 and not Windows XP. So if you are using windows 7 or 8 then try that out or if you know something about that let me know. I am using MS office 2007 and new formats introduced in it are remarkable. In word of MS Office 2003 you could produce .doc file but in newer versions (from MS Office 2007 onward) this format is changed to .docx format and .docx format is enhanced and better than .doc format. Using latest versions you can save files as .doc if you want people having old version of MS office can read those documents. You’ll get Microsoft Office Compatibility Pack there that will allow you to edit or save files with new Office formats using old Office (Office 2003). This will allow you to open, edit or save files as new formats (This is for all components of Microsoft Office including prower point, exel and others). Why new formats are better than old? You may think why .docx format is better than .doc, so let me tell you that new format have less file size as compared to old one. File format .docx could be recovered easily than that of .doc format. You can consider .doc file as simple file and .docx file as compressed .zip file. Files .docx are easy to distribute through emails and through web because of their small sizes. I think you should upgrade to at least 2007 version of Microsoft Office or if you don’t want to upgrade from old versions then simply download and install new formats so that you can work with new formats. Otherwise you can also use some open source alternatives of Microsoft office if you don’t want to spend cash on Microsoft Office.